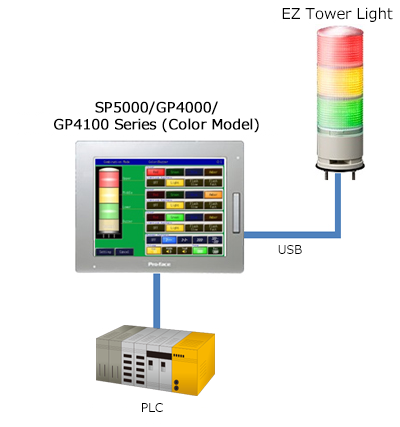 You can set up the operation of EZ Tower Light (such as color of lighting, blinking speed, buzzer) on HMI. *1 The display type of this sample project file is set to the above model. Please change the model to the type of you are using. For details, refer to the Technical Guide in the downloaded file. *2 EZ Tower Light can not be used with the GP4100 Series monochrome model. Controls lighting color, blink rate, and buzzer of EZ Tower Light, in accordance with an input signal depending on the settings. ・Direct word mode: Lighting color, blink speed, and buzzer can be controlled by inputting word data from an external device (e.g. PLC). ・Direct bit mode: Lighting color, speed, and buzzer can be controlled by inputting bit data from an external device (e.g. PLC). ・Normal mode: Based on the setting on a touch panel (Lighting color, speed and buzzer), lamp and buzzer are operated respectively by inputting bit data from an external device (e.g. PLC). ・Combination mode: Based on the pattern setting on a touch panel (Lighting color, speed and buzzer), operation is made in combination of lamp and buzzer by inputting a numeric value (0 - 16) from an external device (e.g. PLC). EZ tower lights operation setting (flashing lights color, speed, and buzzer). Save the setting data onto USB memory or SD card and reuse it. Display the current status of lighting on the screen. We do not guarantee that the operation of this sample will be uninterrupted or error-free.